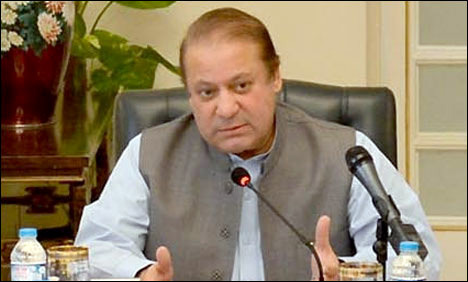 ISLAMABAD (92 News) – A meeting of the parliamentary leaders is under way in Islamabad on Wednesday with Prime Minister Nawaz Sharif in the chair to discuss the Judicial Commission report on alleged rigging in the general election 2013, and the issue of deseating Pakistan Tehreek-e-Insaf (PTI) MNAs. Sources say the meeting will also discuss the resolutions submitted by MQM and JUI-F in the National Assembly regarding the issue of de-seating PTI members of the National Assembly who remained absent from the house over 40 days during the days of the sit-in. The leaders attending the meeting include Syed Khursheed Shah, Maulana Fazalur Rehman, Rasheed Gudial, Mahmood Khan Achakzai, Ijaz ul Haq, Sirajul Haq, Ghulam Ahmad Bilour, Khalid Maqbool Siddiqui, and Mushahid Hussain Syed. The PM is also expected to attend the Parliamentary session today.